Wales' first minister is facing new allegations he misled the assembly. The latest accusations relate to claims concerns were raised with Carwyn Jones about the conduct of a former advisor. Ex-minister Leighton Andrews said Mr Jones's recent answers to AMs were misleading "on several occasions". Mr Andrews has asked Mr Jones to refer all "relevant answers" to an independent investigation into what the first minister has said about claims of bullying in his government in 2014. The bullying claims emerged following the death of former Labour minister Carl Sargeant. On at least two occasions over the past few weeks, Mr Jones has denied any allegations were made to him in relation to the code of conduct of special advisors. But Mr Andrews himself has said that he raised concerns with Mr Jones back in 2014. On 22 November, Conservative AM Darren Millar asked: "Did the first minister receive any reports, or was he made aware of any allegations of breaches of the code of conduct for special advisers in the six months ending 31 December 2014 and, if so, when, about whom, and what action, if any, was taken?" In a written answer on 4 December, Mr Jones answered: "No such allegations were made to me and no reports were received." During First Minister's Questions on 5 December, the leader of the Welsh Conservatives, Andrew RT Davies asked: "First minister, did Leighton Andrews make a complaint of any nature in 2014 about the conduct or behaviour of members of staff in the Welsh Government or your office?" The first minister replied: "No." In an answer to a later question from Mr Davies, Mr Jones said: "I've said no allegation was made by Leighton Andrews to me in regard to bullying. "Were there issues that arose? Yes, there would be conflicts now and again between people-disputes about the titles of bills, for example. "When you have a talented team of people, sometimes they will rub up against each other." Welsh Conservatives leader Andrew RT Davies said: "Welsh Ministers of the Crown, and in particular the first minister, have a responsibility to adhere to the highest principles of honesty, transparency and integrity. 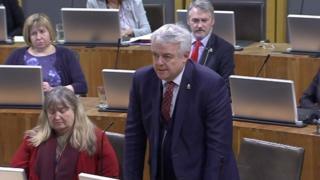 "The letter alleges that Carwyn Jones has on several occasions fallen short of these principles, and in doing so opens himself up to allegations that he broke the Ministerial Code by misleading assembly members. "Mr Andrews also casts doubt on the independence of the inquiry which is currently underway. "We need absolute assurances from the first minister that he will in no way be screening the evidence being submitted to the inquiry and that any forthcoming information will be received and reviewed only by the independent investigator and his team." Earlier on Thursday Mr Jones told BBC Wales no-one had mentioned bullying "at all" when concerns were raised within the Welsh Government in 2014. The first minister refused to be drawn on allegations from Conservative AM Darren Millar, who revealed on Tuesday that Mr Sargeant confided in him about bullying in 2014. Asked whether there was now growing evidence - from Mr Millar and Mr Andrews - that problems were raised, but nothing was done, he said: "No. I stand by what I've said over the last few weeks and again I have nothing to add. "There were no concerns raised with me about bullying."